Minxha, J., Mosher, C., Morrow, J. K., Mamelak, A. N., Adolphs, R., Gothard, K. M., & Rutishauser, U. (2017). Fixations Gate Species-Specific Responses to Free Viewing of Faces in the Human and Macaque Amygdala. Cell reports , 18(4), 878-891. Neurons in the primate amygdala respond prominently to faces. This implicates the amygdala in the processing of socially significant stimuli, yet its contribution to social perception remains poorly understood. We evaluated the representation of faces in the primate amygdala during naturalistic conditions by recording from both human and macaque amygdala neurons during free viewing of identical arrays of images with concurrent eye tracking. Neurons responded to faces only when they were fixated, suggesting that neuronal activity was gated by visual attention. Further experiments in humans utilizing covert attention confirmed this hypothesis. In both species, the majority of face-selective neurons preferred faces of conspecifics, a bias also seen behaviorally in first fixation preferences. Response latencies, relative to fixation onset, were shortest for conspecific-selective neurons and were ∼100 ms shorter in monkeys compared to humans. This argues that attention to faces gates amygdala responses, which in turn prioritize species-typical information for further processing. Ballesta, S., Mosher, C. P., Szep, J., Fischl, K. D., & Gothard, K. M. (2016). Social determinants of eyeblinks in adult male macaques. Scientific reports , 6, 38686. Videos with rich social and emotional content elicit natural social behaviors in primates. Indeed, while watching videos of conspecifics, monkeys engage in eye contact, gaze follow, and reciprocate facial expressions. We hypothesized that the frequency and timing of eyeblinks also depends on the social signals contained in videos. We monitored the eyeblinks of four male adult macaques while they watched videos of conspecifics displaying facial expressions with direct or averted gaze. The instantaneous blink rate of all four animals decreased during videos. The temporal synchrony of blinking, however, increased in response to segments depicting appeasing or aggressive facial expressions directed at the viewer. Two of the four monkeys, who systematically reciprocated the direct gaze of the stimulus monkeys, also showed eyeblink entrainment, a temporal coordination of blinking between social partners engaged in dyadic interactions. Together, our results suggest that in macaques, as in humans, blinking depends not only on the physiological imperative to protect the eyes and spread a film of tears over the cornea, but also on several socio-emotional factors. Mosher, C. P., Zimmerman, P. E., Fuglevand, A. J., & Gothard, K. M. (2016). Tactile Stimulation of the Face and the Production of Facial Expressions Activate Neurons in the Primate Amygdala. eNeuro , 3(5). The majority of neurophysiological studies that have explored the role of the primate amygdala in the evaluation of social signals have relied on visual stimuli such as images of facial expressions. Vision, however, is not the only sensory modality that carries social signals. Both humans and nonhuman primates exchange emotionally meaningful social signals through touch. Indeed, social grooming in nonhuman primates and caressing touch in humans is critical for building lasting and reassuring social bonds. To determine the role of the amygdala in processing touch, we recorded the responses of single neurons in the macaque amygdala while we applied tactile stimuli to the face. We found that one-third of the recorded neurons responded to tactile stimulation. Although we recorded exclusively from the right amygdala, the receptive fields of 98% of the neurons were bilateral. A fraction of these tactile neurons were monitored during the production of facial expressions and during facial movements elicited occasionally by touch stimuli. Firing rates arising during the production of facial expressions were similar to those elicited by tactile stimulation. In a subset of cells, combining tactile stimulation with facial movement further augmented the firing rates. This suggests that tactile neurons in the amygdala receive input from skin mechanoceptors that are activated by touch and by compressions and stretches of the facial skin during the contraction of the underlying muscles. Tactile neurons in the amygdala may play a role in extracting the valence of touch stimuli and/or monitoring the facial expressions of self during social interactions. Putnam, P. T., Roman, J. M., Zimmerman, P. E., & Gothard, K. M. (2016). Oxytocin enhances gaze-following responses to videos of natural social behavior in adult male rhesus monkeys. Psychoneuroendocrinology , 72, 47-53. Gaze following is a basic building block of social behavior that has been observed in multiple species, including primates. The absence of gaze following is associated with abnormal development of social cognition, such as in autism spectrum disorders (ASD). Some social deficits in ASD, including the failure to look at eyes and the inability to recognize facial expressions, are ameliorated by intranasal administration of oxytocin (IN-OT). Here we tested the hypothesis that IN-OT might enhance social processes that require active engagement with a social partner, such as gaze following. Alternatively, IN-OT may only enhance the perceptual salience of the eyes, and may not modify behavioral responses to social signals. To test this hypothesis, we presented four monkeys with videos of conspecifics displaying natural behaviors. Each video was viewed multiple times before and after the monkeys received intranasally either 50 IU of OT or saline. We found that despite a gradual decrease in attention to the repeated viewing of the same videos (habituation), IN-OT consistently increased the frequency of gaze following saccades. Further analysis confirmed that these behaviors did not occur randomly, but rather predictably in response to the same segments of the videos. These findings suggest that in response to more naturalistic social stimuli IN-OT enhances the propensity to interact with a social partner rather than merely elevating the perceptual salience of the eyes. In light of these findings, gaze following may serve as a metric for pro-social effects of oxytocin that target social action more than social perception. Mosher, C. P., Zimmerman, P. E., Fuglevand, A. J., & Gothard, K. M. (2015). Tactile Stimulation of the Face and the Production of Facial Expressions Activate Neurons in the Primate Amygdala. eNeuro , 3(5). Burke, S. N., Thome, A., Plange, K., Engle, J. R., Trouard, T. P., Gothard, K. M., & Barnes, C. A. (2014). Orbitofrontal cortex volume in area 11/13 predicts reward devaluation, but not reversal learning performance, in young and aged monkeys. The Journal of Neuroscience , 34(30), 9905-16. The orbitofrontal cortex (OFC) and amygdala are both necessary for decisions based on expected outcomes. Although behavioral and imaging data suggest that these brain regions are affected by advanced age, the extent to which aging alters appetitive processes coordinated by the OFC and the amygdala is unknown. In the current experiment, young and aged bonnet macaques were trained on OFC- and amygdala-dependent tasks that test the degree to which response selection is guided by reward value and can be adapted when expected outcomes change. To assess whether the structural integrity of these regions varies with levels of performance on reward devaluation and object reversal tasks, volumes of areas 11/13 and 14 of the OFC, central/medial (CM), and basolateral (BL) nuclei of the amygdala were determined from high-resolution anatomical MRIs. With age, there were significant reductions in OFC, but not CM and BL, volume. Moreover, the aged monkeys showed impairments in the ability to associate an object with a higher value reward, and to reverse a previously learned association. Interestingly, greater OFC volume of area 11/13, but not 14, was significantly correlated with an animal's ability to anticipate the reward outcome associated with an object, and smaller BL volume was predictive of an animal's tendency to choose a higher value reward, but volume of neither region correlated with reversal learning. Together, these data indicate that OFC volume has an impact on monkeys' ability to guide choice behavior based on reward value but does not impact ability to reverse a previously learned association. Gothard, K. M. (2014). The amygdalo-motor pathways and the control of facial expressions. Frontiers in neuroscience , 8, 43. Mosher, C. P., Zimmerman, P. E., & Gothard, K. M. (2014). Neurons in the monkey amygdala detect eye contact during naturalistic social interactions. Current Biology , 24(20), 2459-64. Primates explore the visual world through eye-movement sequences. Saccades bring details of interest into the fovea, while fixations stabilize the image. During natural vision, social primates direct their gaze at the eyes of others to communicate their own emotions and intentions and to gather information about the mental states of others. Direct gaze is an integral part of facial expressions that signals cooperation or conflict over resources and social status. Despite the great importance of making and breaking eye contact in the behavioral repertoire of primates, little is known about the neural substrates that support these behaviors. Here we show that the monkey amygdala contains neurons that respond selectively to fixations on the eyes of others and to eye contact. These "eye cells" share several features with the canonical, visually responsive neurons in the monkey amygdala; however, they respond to the eyes only when they fall within the fovea of the viewer, either as a result of a deliberate saccade or as eyes move into the fovea of the viewer during a fixation intended to explore a different feature. The presence of eyes in peripheral vision fails to activate the eye cells. These findings link the primate amygdala to eye movements involved in the exploration and selection of details in visual scenes that contain socially and emotionally salient features. Gothard, K. M. (2016, Fall). The Magic of Emotional Touch . Distinctive Voices. UC Irvine: National Academy of Sciences. Gothard, K. M. (2016, Spring semester). Science Cafe public lecture in Tucson . Science Cafe. 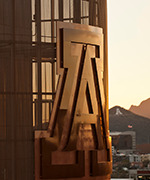 Tucson: University of Arizona. Gothard, K. M. (2016, Summer). Lecture for Tucson Harvard CLub . Tucson Harvard Club. Tucson: Tucson Harvard Club. Gothard, K. M. (2016, Summer). Tactile stimulation of the face and the production of facial expressions activate neurons in the primate amygdala . Gordon Research Conference, The Neurobiology of Cognition,. Sunday River, ME: Gordon research Conferences. Gothard, K. M. (2016, summer). Attentional selection gates responses of face-selective cells in the human and macaque amygdala . 30-th Center for Visual Science Symposium, University of RochesterUniversity of Rochester. Gothard, K. M., Mosher, C. P., Zimmerman, P. E., & Fuglevand, A. J. (2016, May). The neural basis of the receiving-emitting cycle of facial expressions in macaques . The Neuroscience of Emotion. Erice Italy: University of Parma. Gothard, K. M. (2015, August). The social functions of the primate amygdala . Gordon Research Conference - The Amygdala in Health and Disease. Stonehill College MA: Gordon Research Conferences. Gothard, K. M. (2015, July). Close-loop computations in the social circuits of the primate brain . Telluride workshop on Neuromorhic engineering. Telluride CO: National Science Froundation. Gothard, K. M. (2015, July). Social cognition in rhesus macaQUES . NEUREX meeting on "Cognition in Primates". Strasbourg, France: NEUREX. http://www.neurex.org/event/meeting-cognition-of-primates/The editors of Brain and Behavioral Sciences invited the speakers at this conference to contribute to a special issues of the journal. I will have to submit an article to this journal in August 2016. Gothard, K. M. (2015, June). Neural circuits of emotion and social cognition in hte primate brain . Intenatinal Summer school of Cognitive Neuroscience, Lyonn, France. Lyonn, France: CNRS France (equivalent to NIH, USA). I gave four lectures to faculty and students at this summer school. Gothard, K. M. (2015, October). The Neurophysiology of social cognition in rhesus macaQUES . Association of Primate Veterinarians Workshop. Scottsdale AZ: Assoiation of Primate Veterinarians. Gothard, K. M. (2014, December). Naturalistic social stimuli elicit eye-selective neural responses in the monkey amygdala . Seminar Series of the Scientific Director of the National Institute of Mental Health. Washington DC: National Institute of Mental Health. Gothard, K. M. (2014, October). Oxytocin enhances social behaviors in macaques . Annual Meeting of the Society for Social Neuroscience. Washington DC: Society for Social Neuroscience. Gothard, K. M. (2014, Spring semester). The role of the primate amygdala in the receiving-emitting cycle of facial expressions . Research Seminar at the Vision Center University of Rochester. Rochester: University of Rochester. Gothard, K. M. (2014, fall). Primate models of emotion and social behavior . Kavli Frontiers of Science. Beijing, CHIna: National Academy of Science. Gothard, K. M. (2014, fall). The eyes: a window to the social brain . Johns Hopkins University: Special conference on neural recordings from the human brain. Gothard, K. M. (2014, summer). The central role of the amygdala in social behavior . International Workshop of Neuromorphic Engineering. Telluride, Colorado: UC San Diego.